Here in Ohio farm country, we've got fly-swatting down to a fine art. 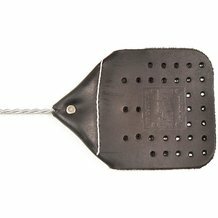 Now you can be an expert too with our leather fly swatter. I have purchased these fly swatters several times. And the leather holds up fine but the meal wire needs to be thicker. They keep breaking in half after bending the metal wire when being used a lot. I like the fly swatters but I wish they would make them STRONGER. I have many fly swatters i have thrown away or tried to repair to keep using. Lehman's says: We're so sorry for your experience and are looking into this issue. Please give us a call so we can make it right: 1-800-438-5346. I bought one of these years ago. I loved it. I bought another one a couple of years later and the metal was so flimsy, I threw it away. I'm going to try ordering another one since this one looks different. I hope it's like the original! I love the fact that this fly swatter is made of leather. I hate the fact that the metal handle is too flimsy. It bends like a wet noodle. Lehman's says: We're so sorry for your experience. Please call us, so we can make it right: 1-800-438-5346. Worth every penny x2. No more plastic here. Just received this swatter. I was impressed with the quality of the leather and the heavy metal material. I love the fact that it was made here in the USA! I may have paid a little more but I will never buy a plastic fly swatter again! I have my own and also one I personally bought for work. I will not use the plastic ones that get frail, bent, and are so light that they cannot kill a gnat! As my children leave home and set up their own homes, I buy them their own leather swatter. It is a great housewarming gift. While the leather is top-quality, the wire handle is too soft/weak. When you swing the flyswatter, the metal handle bends backwards. If you kill a fly with this thing it will be due more to luck than skill. A strong, non-bending handle would make this a keeper. Like others have said, the handle is to flimsy to work, and the leather/swatter part left black marks all over my walls. Too bad I bought 2. My dad did not rest until I got a couple of these. they are by far the heaviest- duty fly swatters anywhere! Using the same amount of force I did with the cheap plastic ones I almost broke a window! I hold it at the end and the handle never bent. i love these things! These last SO much longer than the cheap plastic ones available out there. They also work well at killing the flies of which we have plenty! SO don't hesitate in buying some for fly season. Great fly swatter, just make sure you choke up a bit on the handle. If you hold it at the very end where the loop is it will bend, but if you hold it at the bottom of the twisted section it will not bend. I was getting so annoyed with all of the plastic and mesh fly swatters on the market and how quickly they fell apart. Then I discovered Lehman's leather fly swatter. This thing is made to work well and last a long time - the way things should be made. I will never buy another plastic or mesh fly swatter. In fact, the way the leather one is holding up, I may never buy any fly swatter again! Leather swatter is great. Handle is too short and too flimsy. The handle bent the first time it was used. You'll need to build a new handle to use effectively. Would not recommend. I don't know what kind of handles some reviewers got on their swatters that they're bending, but the one we have is heavy duty stuff. It's thick and strong, far sturdier than the handles on the plastic swatters we were using. Maybe these folks don't know their own strength! This fly swatter is well made out of quality material. It is meant to last for years. I love this fly swatter and it did last a long time. I have to agree with others about the wire. Considering how durable the leather swatter is, the wire is flimsy. They could easily make this better by using stronger wire. Apparently, it used to be better quality. I'm going to order a couple more. I will update my review (if it's possible) after I try the new one. $5 for a swatter plus shipping, you would expect it to not be flimsy. At last I can defend myself with a reliable fly swatter. This thing is built to last and is deadly. The fly swatter is much better than the plastic ones, but the wire handle is flimsy. It has lasted 5 years and hopefully the handle will last another five because the leather part will. Had good hopes for this fly swatter. The leather part is fantastic, but the wire handle is super flimsy. You go to swat it, and the handle bends over, negating the action and usefulness of the item. Wish they'd make it with a stronger non-bendy handle. We've had one for over 15 years. Still as steardy as day 1. Works great on bees and wasps too! The leather part is really nice but the metal handle is kind of flimsy. 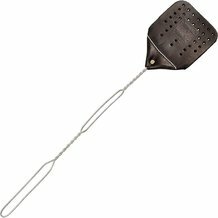 The leather swatter is extremely effective at landing a killing blow with only low velocity smacks. (Indeed, the only reason this is not a 5-star rating is that the wire handle is a little too ductile for the weight of the leather, and if you get carried away and swing hard the handle bends all out of shape. Having said that, this is the ne plus ultra of flay swatters. The heavy weight leaher even works using the *edge* of the swatter in a tight space. great price, looks and works better than those cheap plastic ones. I give them as gifts and everyone loves them. wire handles very flimsy. wooden handles were much better. why they went to wire who knows. These are very handsome. I did use a black marker to darken the white stitching, but that's just my personal taste. I have had this fly swat for more than 11 years! Excellent quality! I highly recommend this. Great for flies, bees and all manner of creeping bugs! Even great for the occasional swat on the backsides for the children!!! This is a terrific flyswatter. I bought it to replace the one my dad has used for year's. He's most delighted with this new replacement! Thanks for bringing us American-made products. WOW, usually I miss the fly, but not with this fly swatter!! This is very well put together and In know Im not going to have to buy another fly swatter for a long time.. I do plan on buying more of thesed tho, so I can have one in every room!! Thanks Lehmans!!! Once again, you need to set up a Lehmans in Oklahoma!!! I LOVE you all!! 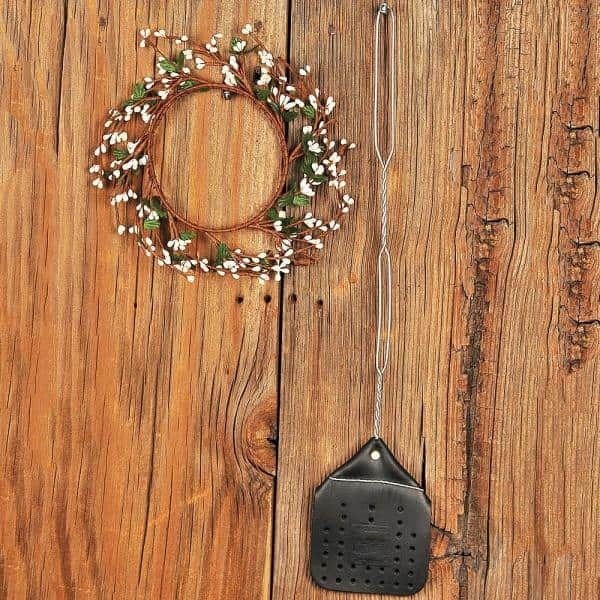 Great Product, I looked all over for a better flyswatter. This is the one! Its attractive enough to sit by my husband's chair. Very well made. Flies beware! This should even take care of big ol hornets. 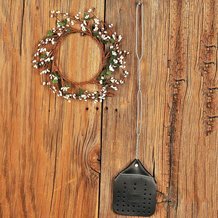 you sure won't have any problems killing flies with this sturdy swatter!